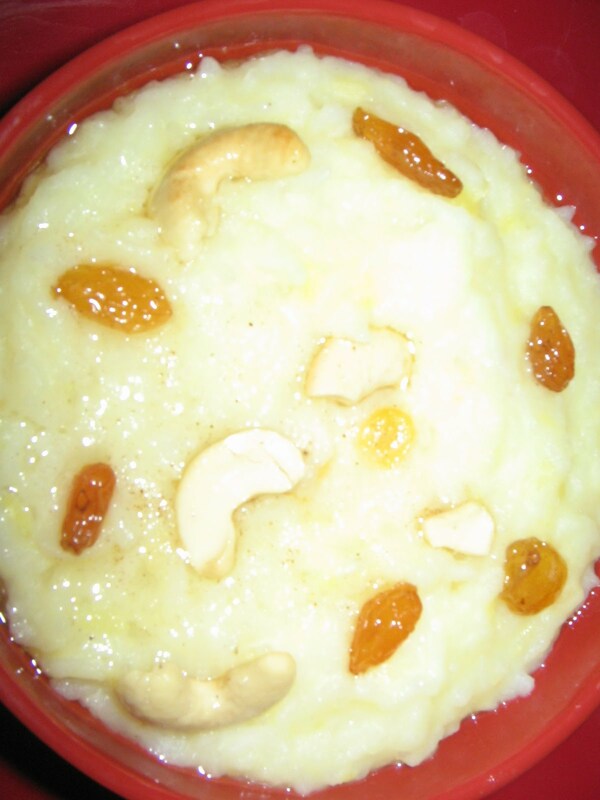 Chhakkara pongal,is a sweet dish,which is prepared with pesara pappu/moong daal and rice.It is prepared for prasadams in south india,especially in Temples, and south indian homes,for Lord Sri Maha Vishnu..
3 min.Then switch off the stove and wash pesara pappu 1 time ..Now add rice to it and again wash both of them for 2 to 3 times.Now add milk and water to it and cook in a pressure cooker for 3 whistles.Switch off the stove and let it cool. Meanwhile add 1 cup of water to the sugar and boil it, to thin pakkam.After the pressure is gone ,open pressure cooker and pour the sugar pakam and mix well. Now transfer the total prasadam in to a pan,switch on the stove,and keep the pan and let it be cooked well for a 5 min . Ina tbsp of ghee fry raisins and cashewnute seperately,now sprinkle the elaichi powder on the chhakkara pongal ,add the remaining ghee ,half of the fried cashew nuts and raisins and mix well.Swich off the stove and garnish with the remaining amount of nuts..Serve hot.This dish is prepared/offered as naivedyam before god,which enhances more taste..
Iuse less ghee in my kitchen,thats why i recommended only 2 to 3 tbsp.But u can add up to 1 cup of ghee totally if u want to..Iprepared this dish for the 1 st week of sravana sukravaram..
i have been looking 4 this recipe for a while..yours look perfect n authentic..will try it.. Even I have had it with jaggery.. Should give a try with sugar..
the pongal looks delicious and nice.